HealthPostures, one of America's progressive worker mobility designers, announces that it has entered into a dealer agreement with Massachusetts based Office Oxygen. One critical key to a healthy and happy workplace is being able to stand when you want to and sit when you need to. 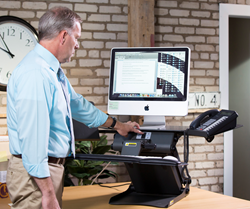 HealthPostures, one of America's progressive worker mobility designers, announces that it has entered into a dealer agreement with Office Oxygen. The new deal will make it easier for organizational leaders and individual workers, like contractors and freelancers, located in Massachusetts and surrounding areas to get office mobility and pain reducing equipment and accessories. Office Oxygen leader, Sue Doctoroff Landay, shares that Office Oxygen decided to carry HealthPostures' products, starting with the TaskMate Go line, because, Office Oxygen has a "keen interest in sit-to-stand workstations. " Interest in sit-to-stand workstations is rooted in an Office Oxygen belief that, "one critical key to a healthy and happy workplace is being able to stand when you want to and sit when you need to." Landay says that, "We only sell products that we believe will make people happier and more productive at work." She continues, "Being able to stand up at your desk is key to feeling healthy and to working effectively because movement promotes blood circulation and oxygen to the brain. In other words, in addition to making you feel better physically, standing helps your mind function better. And yet, sometimes, we need to sit and really focus. I suppose that’s why we feel the sit-to-stand desk options are so ideal." Worker mobility isn't the only reason why Office Oxygen entered into a dealer agreement with HealthPostures. Specifically, Landay shares that, "Another benefit of HealthPostures products is their ease-of-use and price point. We were looking for sit-to-stand monitors that were less expensive than the electric versions, but still really easy to use. If it’s too hard to re-position from sitting-to-standing-to-sitting, the product won’t be used." Inspiration to start Office Oxygen extends back to the organization's sister company, Trainers Warehouse. As Sue Landay says, "For over 20 years our sister company, Trainers Warehouse, has been developing and selling products that make training and learning more innovative, effective, and fun." Partnering with HealthPostures is already paying off for Office Oxygen. "HealthPostures has been easy to work with from the get-go," Landay reveals. "They’ve been incredibly responsive in helping us expand this [ergonomics] category of products. We’re thrilled to be working with them." Founded in the 1990s, HealthPostures LLC (https://healthpostures.com) has been a leader in the workplace solutions space for more than two decades. The company specializes in the design and manufacturing of workplace solutions. Products that HealthPostures develops may help to relieve back and neck pain, headaches and other musculoskeletal disorders. A primary mission of HealthPostures' is to "strive to provide quality products that will help transform your sedentary life so you have a healthy way to work." Sought after ergonomics equipment, including sit stand products, that HealthPostures designs include surface Taskmates, the TaskMate Go Laptop, dual monitor sit stand work stations and Stance move seat extensions. The company's strong reputation and proven products and accessories continue to attract distributors and resellers like Office Oxygen. Office Oxygen has been a pioneer in the equipment and innovative business solutions arena for more than 20 years. Aim of the company's products are to reduce worker stress, increase workplace enjoyment and to strengthen teams. The genesis of the family owned business dates back to 1993. Products that Office Oxygen stocks and offers to clients, including small to large organizations, include stress relievers, meeting and facilitation tools, training guides, memory boosters and ergonomics solutions like HealthPostures' TaskMate go products. Office Oxygen services clients in the United States and abroad.